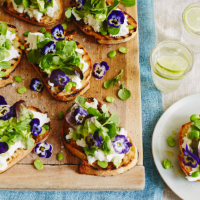 I love the sweet but slightly sharp elderflower flavour against the delicate leaves and burrata, while the smokiness of the charred sourdough adds another dimension. You can make the salad ahead, but always griddle the toasts at the last minute. 1. Blanch the broad beans in boiling water for 2-4 minutes (depending on their size); drain and cool. Peel off the outer skins, unless the beans are small and sweet, in which case you can leave them on. 2. Make the dressing by mixing all the ingredients in a jug; season and set aside. Put the salad in a bowl with the broad beans. 3. Heat a griddle pan over the highest heat. Cut the sourdough into 1.5cm-thick slices and griddle on both sides, until charred. Drizzle with the oil, grate over the lemon zest and season with sea salt. 4. Arrange the toasts on a big platter or individual plates and top with the torn burrata or mozzarella. Toss the salad and broad beans with the elderflower dressing and pile on top.